First off, Happy Thanksgiving! I hope everyone who celebrates got to eat a lot of good food and spend time with loved ones. For my Black Friday sale, all sewing patterns are on sale for $5, today through Monday! And not just that! I have a pattern release that is live today too. It’s been two years since the release of my Christmas stocking pattern, the Yuletide Stocking. For the handmade side of my business, I have made the pattern in several other sizes than just the original, and because I have it digitized, it’s pretty easy for me to convert it to the size I need. This year I decided to make those sizes available to other people! This pattern add-on (which is currently free but will go up in price after the holidays) includes four new sizes. The standard stocking is 18” tall. The new sizes are 12”, 15”, 21”, and 24”. (The pattern, of course, has all dimensions in inches and centimeters). All sizes have the same variations as the original pattern, with four cuff options and four toe options. 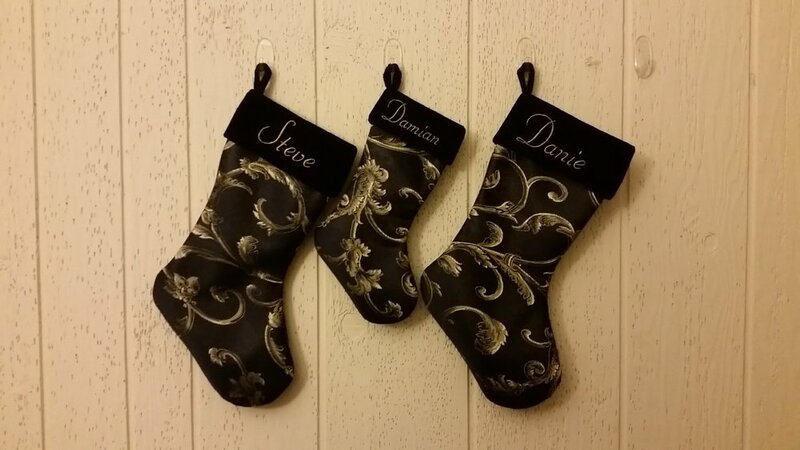 You can make big stockings for mom and dad, medium stockings for the kids, and little stockings for your pets. I gave my testers a short turnaround time but they were super helpful and several made me more than one! This is not a tricky sew. The real fun is in personalizing and experimenting. Here are a X-Small, two combinations of X-Small and Small, and the denim is Small. (Photo credit: Brenna Smith, Cheryl Beason, Lori Peoples, Vanessa Behymer). Here is a Large and two X-Larges. (Photo credit Sandie Larsen, Carolyn Bizzell, Taryn Lynn Torres). And here are two Larges with a Small. (Photo credit Sandie Larsen). Many of you probably downloaded the original Yuletide pattern when it was released, so make sure you don’t have the file before purchasing it again! The add-on will be free until after the holidays. And speaking of holidays, I hope the rest of your weekend is great.